My vase this week is courtesy of a friend who arrived to see my new home with this delightful arrangement. I did not pick these. I did not grow these, but I did put them in the vase. Does that count? I hope it will. 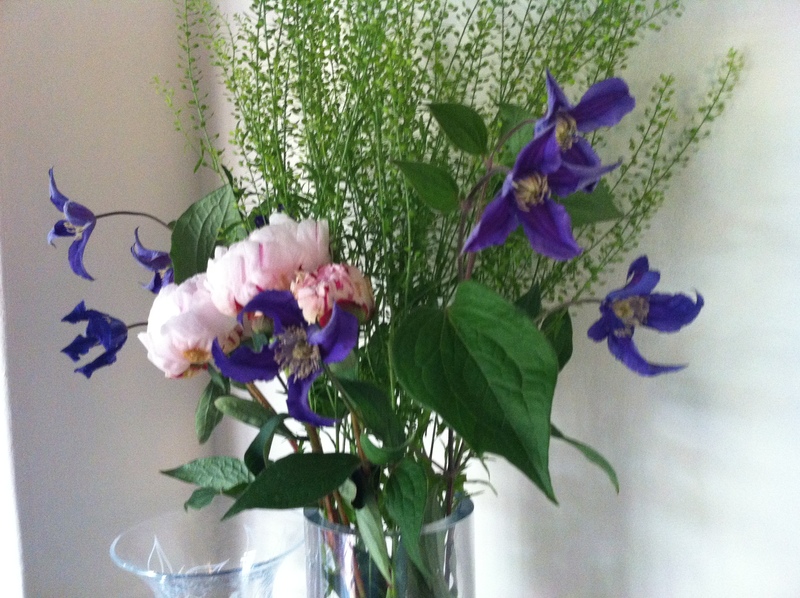 They came from a florist in Winslow and I especially enjoyed the addition of the Clematis. I have never used cut Clematis and thought it quite original. I have to report however that the flowers started to drop after just three days, but I would add that it was rather warm. Life in my garden has changed greatly, I now have no garden to speak of at all. The flowers are non existant save for a few old roses, and by that I mean old not old fashioned. I have yet to transport three truck loads of my plants from their temporary holding bay and this is my plan this week. My Monday in a vase challenge is going to be increasingly tough. It must be a strange position for you to be in, considering your background – will you be moving your plants gradually, or do you intend to draw up a design for your plot first as you have ‘no garden’ to speak of yet? You can be forgiven for your florist’s flowers in the circumstances! It’s interesting to see they have included clematis – are they small flowered? It looks like one of the herbaceous ones like durandii if it is. The clematis I included have flopped too but, as you say, it’s warm – when I used the monta before they lasted several days. Thanks for finding time to post Doris, and hope there are some happy discoveries for you to make in your new garden! Thanks Cathy and good to hear form you. First job is to tear down the post and rail goat pens so I can see the space. Next I shall measure up and start sketching ideas. Already i know that i shall need to get some tree work done. Tree and hedge planting for the Winter months then the fun stuff can go in! D.
ps I thought it was interesting that the florist had used clematis, then i saw your vase and thought ah ha. it was a small flowered clematis with purple/blue blooms. Not sure which one, durandii? 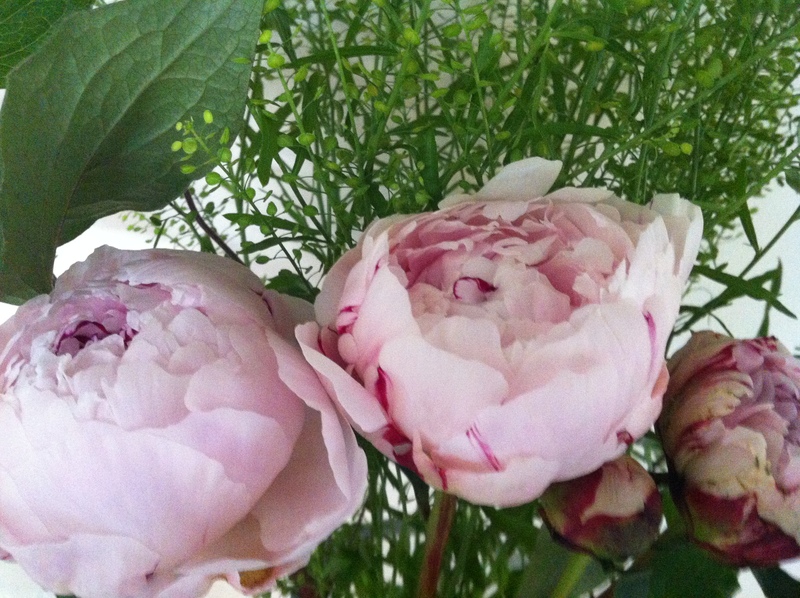 You can’ t beat peonies for a vase. So opulent. The clematis looks very blue, much bluer than durandii. Do you know which one it is? Good luck with your new home and garden. I hope you will be very happy there. Thanks Chloris and good to hear from you. Lots to do in the house and garden, starting with planning. Need to get an area planted as I am feeling quite bereft with no flowers to enjoy. As to the vase, I think the camera made the clematis look bluer than it actually was, it looked dark purple in the flesh. Quite a small head and I should imagine that it could well be durandii. D.